We received a phone call from a pool owner in the Del Cerro area of San Diego. They had the local pool center check a sample of the water and were informed that the water was bad. We quickly scheduled to drain the pool water. 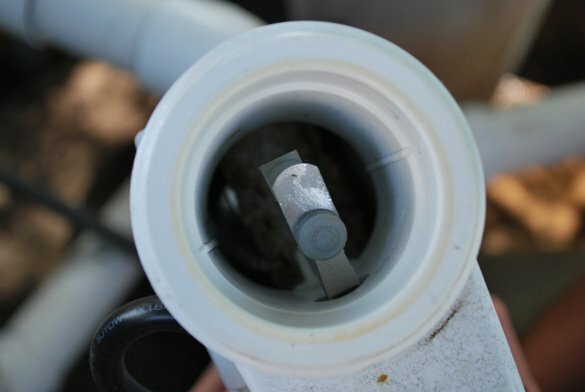 Before draining the water we performed a pool filter clean on their 425 sq. 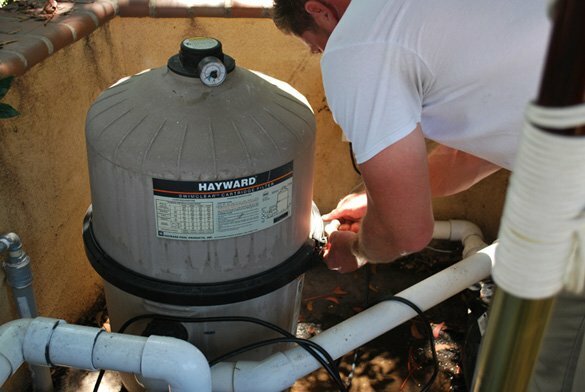 ft. Hayward C4030 Swimclear cartridge filter. The cartridges were removed and hosed down until they were clean. After finishing the pool filter clean we drained the water and refilled with fresh water. 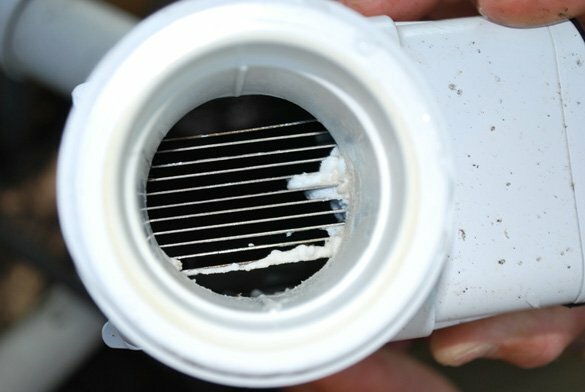 The Pentair IC40 salt generator cell was inspected and needed to be cleaned. To clean the cell the power from the Power Center was turned off and we disconnected the cell cable from the Power Center. 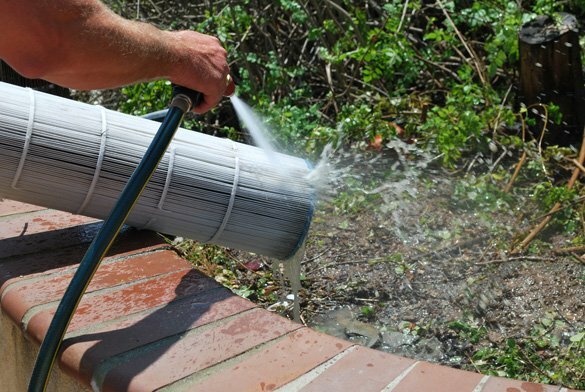 We used a garden hose with a spray nozzle to remove the loose debris. 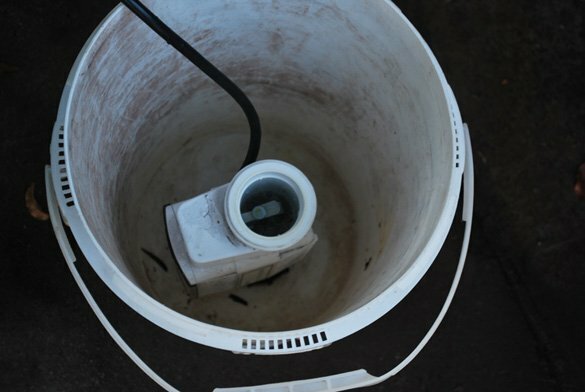 Then we attached the cell cleaning kit to one end of the chlorine generator and placed the cell vertically in a five gallon bucket. We mixed one quart of muriatic acid with one gallon of water in a separate plastic bucket and poured the acid mix into the cell covering the cell blades. Once the calcium was removed, we rinsed and attached the cell hand tight and made sure there were no leaks. 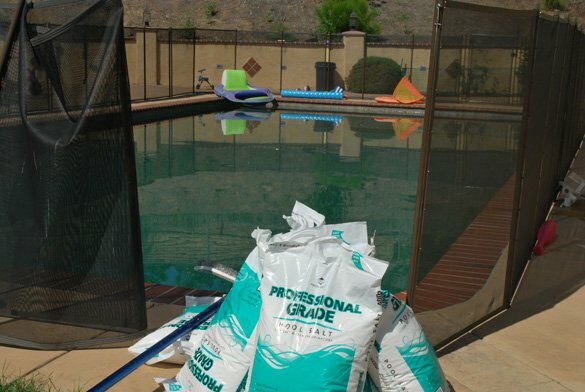 The proper amount of pool salt was then added to the swimming pool and the chemicals were properly balanced.